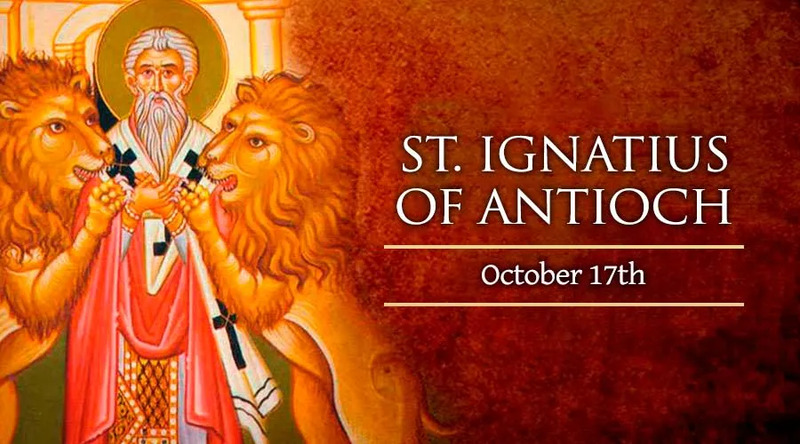 On Oct. 17, the Roman Catholic Church remembers the early Church Father, bishop, and martyr Saint Ignatius of Antioch, whose writings attest to the sacramental and hierarchical nature of the Church from its earliest days. Eastern Catholics and Eastern Orthodox Christians celebrate his memory on Dec. 20. After Domitian's murder in the year 96, his successor Nerva reigned only briefly, and was soon followed by the Emperor Trajan. Under his rule, Christians were once again liable to death for denying the pagan state religion and refusing to participate in its rites. It was during his reign that Ignatius was convicted for his Christian testimony and sent from Syria to Rome to be put to death. Ignatius' letters passionately stressed the importance of Church unity, the dangers of heresy, and the surpassing importance of the Eucharist as the “medicine of immortality.” These writings contain the first surviving written description of the Church as “Catholic,” from the Greek word indicating both universality and fullness. St. Ignatius of Antioch bore witness to Christ publicly for the last time in Rome's Flavian Amphitheater, where he was mauled to death by lions. “I am the wheat of the Lord,” he had declared, before facing them. “I must be ground by the teeth of these beasts to be made the pure bread of Christ.” His memory was honored, and his bones venerated, soon after his death around the year 107.